"What is most striking about Mowgli's story, from a biographical point of view -- as it unfolds in 'Mowgli's Brothers', 'Kaa's Hunting' and 'Tiger! Tiger!' -- is watching Kipling once more rewriting aspects of his own childhood. The pattern of abandonment was repeated no fewer than three times: twice in 'Mowgli's Brothers', which opened with him losing his human parents and closed with him being cast out by the wolf-pack; and again at the end of 'Tiger! Tiger! ', when he was rejected by the village. Mowgli became, in effect, a super-orphan. But while the abandonment motif was magnified, so too were the emotional compensations. Kipling provided Mowgli at each successive abandonment with a queue of would-be foster-parents, falling over each other to look after him: Father and Mother Wolf, Akela the Lone Wolf, Baloo the Bear, Bagheera the Black Panther and Kaa the Python. Not only were all these wild animals eager to care for Mowgli, but they competed with each other for his affection and acknowledged his power over them, a situation that has appealed to generations of child readers. "Equally gratifying for Kipling was Mowgli's eventual outwitting and destruction of Shere Khan the Lame Tiger, the malevolent would-be foster-parent who, like the giant or witch in the fairy story, wanted to eat the hero. Shere Khan stood for [the wife in the English family he was sent to] Mrs. Holloway, and his sidekick, Tabaqui the Jackal, for her son. There were, however, distinct traces of her Evangelical influence, suitably 'improved', in the obsession with rules that ran through the stories and was encoded in the 'law of the jungle'. While these rules emphasised obedience and knowing your place, they also established ties with others and -- one of Kipling's favourite paradoxes -- conferred the freedom to move between different worlds. It was Baloo's teaching that helped to save Mowgli when he was kidnapped by the Bandar-log in 'Kaa's Hunting', in the process allowing him to become another of Kipling's 'boundary-crossers'. 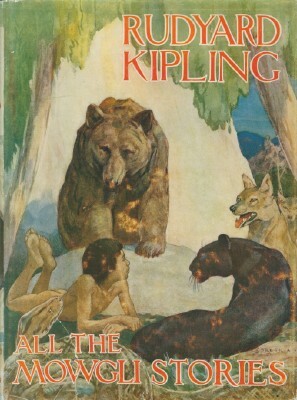 "The main event [for Kipling] in 1895 was the publication in November of The Second Jungle Book. ... All five new Mowgli tales were excellent, adding further chapters to his life in the jungle and bringing it to a fitting conclusion in 'Spring Running'. These additions made it clear that Kipling's model for the overall shape of the Mowgli story was appropriately mythic and had more in common with the structure of older heroic narratives than with the tighter sequential plotting of most nineteenth-century fiction. These older narratives traditionally began with the emergence of the hero and concluded with his death or disappearance, and in between there was a timeless zone in which a number of self-contained episodes took place. So 'How Fear Came' gave a version of the Fall, told by Hathi the Elephant to Mowgli and the other animals during a terrible drought. 'Letting in the Jungle' showed Mowgli saving the couple who were kind to him in 'Tiger! Tiger!' (his human foster-parents) and, with the help of Hathi and his sons, flattening the village. 'The King's Ankus' was a deliberate reworking of 'The Pardoner's Tale', with Mowgli learning a lesson about human greed and Death. 'Red Dog' recounted the epic battle that the boy and the wolf-pack waged against the invading 'dhole-pack', and how Akela the Lone Wolf fought his last fight. Finally, in 'Spring Running', Mowgli, now 'nearly seventeen years old' (Kipling's age when he left school), reluctantly left the Jungle and followed 'a new trail' in the human world. The new book was an instant success, Lockwood proudly telling an Italian friend that it had sold 10,000 copies in England in its first week."